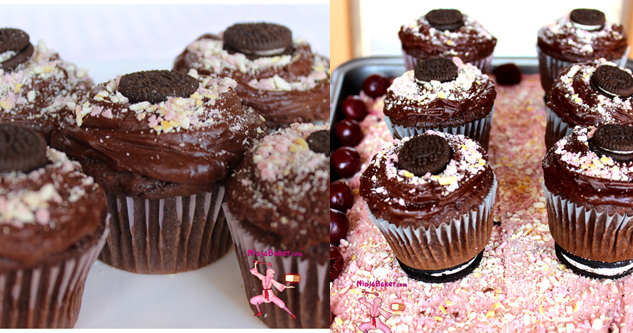 As Pocky, Oreos are tantalizing treats in any season; I whipped them into chocolate cupcakes. And what tray could be more tantalizing than one made out of cake? Chocolate cake smothered with Morello cherry buttercream to be specific. Enjoy! The cake recipe is adapted from the Pillsbury Softassilk flour box. Fluff up the butter for about 3 minutes. Add one tablespoon of sugar at a time to the butter. One at a time, beat in eggs. In a separate bowl, whisk together the cake flour, cocoa, baking soda and salt. Starting and ending with this flour mixture, alternate mixing into the butter/sugar bowl with the buttermilk. Stir in the crushed Oreos and chopped Chocolate Pocky. Ninja Note: Scrape the bowl often to ensure all ingredients are well combined. Fill the cupcake cases about 2/3 full. Pour the remaining batter into the rectangle pan. Cupcake bake time: 21-23 minutes or until a toothpick inserted in center comes out clean. Cake bake time: 30-32 minutes. Allow the baked goods to cool before frosting. Hershey’s Chocolate Frosting adorns my cupcakes. The cake is slathered with my Morello Cherry Buttercream and garnished with strawberry Pocky which was crumbled in the food processor. Morello cherries also decorate the cake. Strawberry Pocky crumbles were sprinkled on the cupcakes and given a mini Oreo center. Combine all the ingredients except the powdered sugar with an electric mixer or a Kitchen stand mixer. Gradually add the sugar. Add liquid or powdered sugar to reach the consistency which sings perfection for you.